Starman: I was not born on your planet Earth. Instead, I was sent here to save you from the Zemarians. You will die if I fail to kill him. Starman is what I am called. Just one question....how come there aren't ever any nice disembodied brains even when not from outer space? We watched this one last night on DVD. It might be a re-edited serial or TV show, I'm not sure. 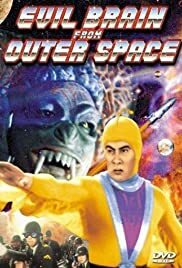 I had avoided those Japanese Starman movies over the years. He seemed a lesser version of Superman. Maybe I was wrong to avoid them. This story was obviously geared for children and gave two of them important roles in saving the earth. Yet, a few of the creatures seemed to be a bit too scary for younger kids. The film had silly overly staged fight scenes, hokey costumes and corny dubbed dialog. In other words we really enjoyed it! Actually, to be fair, there were a few strange looking creatures in it that did freak out my wife when they were on screen. Sometimes they would flash on unexpectedly in closeup. Especially the demon like one with the weird ears and long nails. And the one that looked like a witch. This film is worth seeing if you have an open mind.